Peepal Electro Tech LLP provides OEM service for all types of streetlights. It bears best quality and competitive rates. 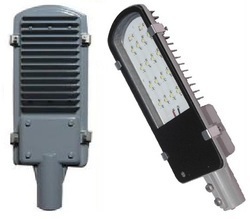 Wide range of street lights offer you to choose according to your requirement. Incorporated in the year 2015, Peepal Electrotech LLP is uniquely positioned amongst the remarkable manufacturers and exporter of an optimum quality range of LED Bulbs, LED Panel Light, LED Tubelight and LED Street Light, LED Floodlight. We provide one stop solution to all your lighting needs, from a screw to the complete fixture. The complete range of products that we provide is developed with use of superior quality components and modular technology. Our valued clients can avail this range of products in a wide range of designs and specifications. Developed with use of upgraded machinery, the range of product is highly appreciated by the customers for its unique design, high illumination, easy installation, longer service life, optimum quality and low power consumptions. Apart from this, our professionals ensure that the entire range of product is manufactured as per the latest market trends.